Low output - The R-101’s sensitivity is among the highest of all passive ribbons, at 3.9 mV/Pa. Proximity effect - Blast screens in the R-101 help reduce bass build-up when close-miking. Durability - The mic’s offset ribbon positioning increases its max SPL. The ribbon element, as in the R-121, is made of 2.5-micron pure aluminum. (Geometry specifications have not been released.) It is offset toward the front of the microphone; this position raises the max sound pressure level for sound entering from the logo side of the microphone, and yields a brighter response from the rear of the microphone. This design positions the ribbon element slightly forward of the center of the microphone (closer to the logo side), giving more room for rearward excursions of the ribbon element during high SPL use. The sonic difference on the back side was actually a happy accident. 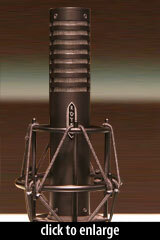 Being offset, the ribbon element is in a different position relative to the chamber of the microphone. When the mic is flipped around, the difference in the ribbon position creates an acoustical difference that is quite useful. The effect is only noticed at distances of three feet or closer to the mic. Distant sound sources (further than three feet from the mic) will record exactly the same on both sides of the microphone. 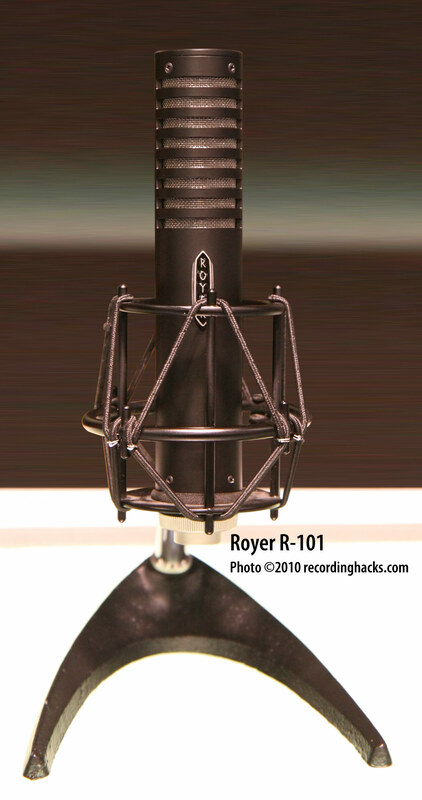 To keep costs down, Royer Labs uses an imported housing and shockmount for the R-101. The microphones are assembled and tested by hand in California. The mic ships with a protective sock and elastic shockmount in a padded metal flightcase. The ribbon element is warrantied for one year. The rest of the microphone carries a lifetime warranty to the original owner. The R-101 is a good-sounding, entry-level mic. Of course, the question will arise: “How does it hold up against to an R-121?” The answer is, pretty well. Yes, the R-121 is richer, has more bottom end, is slightly more open at the top and offers about 1dB more of output… The upside of the R-101 would be its almost windproof ribbon and resistance to drop failure. Those who find classic ribbon mics too dull or bass-heavy as compared to condenser mics, or simply too expensive, would be well-advised to check out this newcomer. The Royer Labs R-101 is also known as: R101.